Funko has unveiled its upcoming line up of Solo: A Star Wars Story vinyl figures, including a fun series of movie specific Solo Dorbz that will be sold exclusively at The Disney Store! The Solo: A Star Wars Story Dorbz Series includes Han Solo, Chewbacca, Lando Calrissian and Qi’Ra. 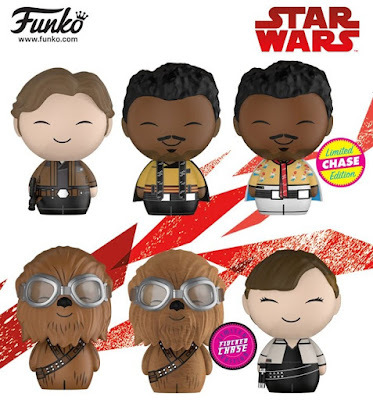 There are even two limited edition 1 in 6 chase variants for Lando and Chewy. Plus, the Chewy chase is flocked! Opting for high quality paint designs over detailed sculpts, these pint-sized rascals will weasel their way into your heart as surely as they’ll find their way onto your shelf. Each Solo: A Star Wars Story vinyl figure stands 3” tall and comes in window-box packaging to fully display each character through front and back box panels. They will retail for around $7.99 each.